Donald Trump looks like he was isolating himself at the G7 summit in Quebec. Prime Minister Justin Trudeau, British Prime Minister Theresa May, French President Emmanuel Macron, German Chancellor Angela Merkel, and U.S. President Donald Trump discuss the joint statement following a breakfast meeting at the G7 summit in La Malbaie, Que. on June 9, 2018. It's common for world leaders to travel with official staff photographers, and what they capture is often revealing. 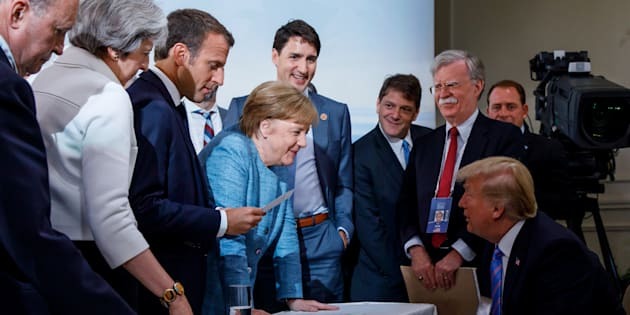 Take, for example, several angles of the same scene of U.S. President Donald Trump and the other Group of Seven leaders at their summit in Charlevoix, Que. this weekend. The comparison of the official photos were shared on Twitter by German journalist Fabian Reinbold. Merkel's team posted the first photo on Saturday, calling the scene a "spontaneous meeting between two working sessions." It has since gone viral for the visual depiction of Merkel standing over Trump, who has his arms crossed. A shot from Prime Minister Justin Trudeau's photographer Adam Scotti shows the Canadian leader standing next to Trump, looking up at the European leaders across from him. And announced he would not honour the G7's collective communique he'd signed hours earlier. As they say, a picture says a thousand words. What do you see in the six different photos?